As soon as the first glimmers of grilling season appear in the Northeast, our local Price Chopper starts carrying 6-packs of portabella caps, advertised as “portabella grillers.” I get pretty excited about these and usually wind up buying several over the course of the spring and summer. Of course, when cooking for two people, there are inevitably more portabella caps per package than can be used in one recipe. What to do? Find another awesome portabella recipe, of course! This is the very photogenic filling for Fajitas Bonitas out of The 30-Minute Vegan. I’ve eyed this recipe numerous times since acquiring the cookbook, and usually the one thing I lacked to make it was portabella mushrooms. But this time I had everything on hand, including the optional jalapeno. I loved how all the colors looked together as the veggies were cooking. 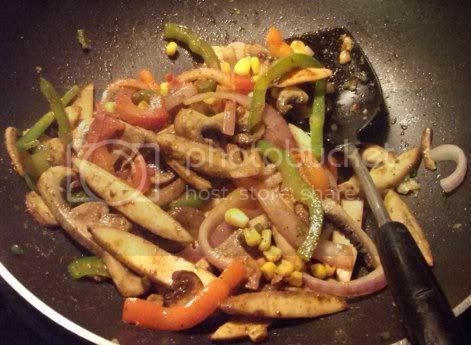 I used red onion, red and green bell peppers, part of a jalapeno, and corn–quite the color mix! This is a very easy recipe that’s perfect for serving a bunch of people if you have enough veggies. You can put the filling in a bowl as the book suggests and let people build their own fajitas! 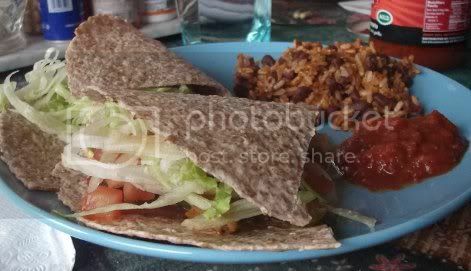 There was also a picture of these served with rice and beans, so I cooked up some brown rice, tossed in leftover black beans, and seasoned it with chili powder, cumin, oregano, black pepper, hot sauce, and lime juice. It made a tasty side dish and was a great way to round out the meal. 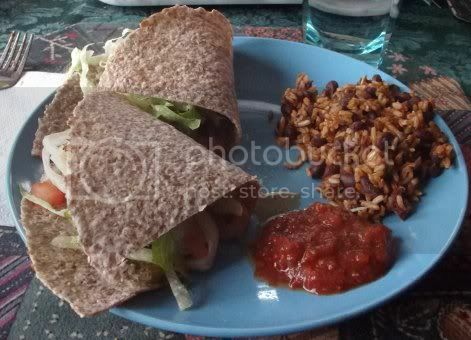 I served the fajitas on Ezekiel sprouted grain tortillas, cut in half to form smaller pockets. It was messy, but satisfying! My mom and I enjoyed it a lot. Grilling the veggies for this would also taste pretty good, so I might try to do that over the summer. It’s been a long time since I grilled anything. Question for the comments: What’s your favorite way to prepare and eat portabella mushrooms?